RENO, NV OCTOBER 18, 2011 Lincoln Electric’s immensely popular Money Matters™ campaign has been expanded to include subsidiary Torchmate’s automated plasma cutting 2×2™ CNC Prototyping System. 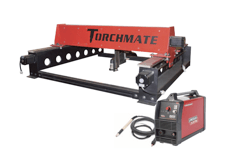 The package includes the Torchmate® 2×2™ CNC Prototyping System and Torchmate® CAD Lite design software together with the Lincoln Electric Tomahawk® 625 plasma cutting system and machine torch. When purchasing at authorized Money Matters™ program distributors, customers may choose a $300 rebate OR a 2×2™ water table valued at over $800. 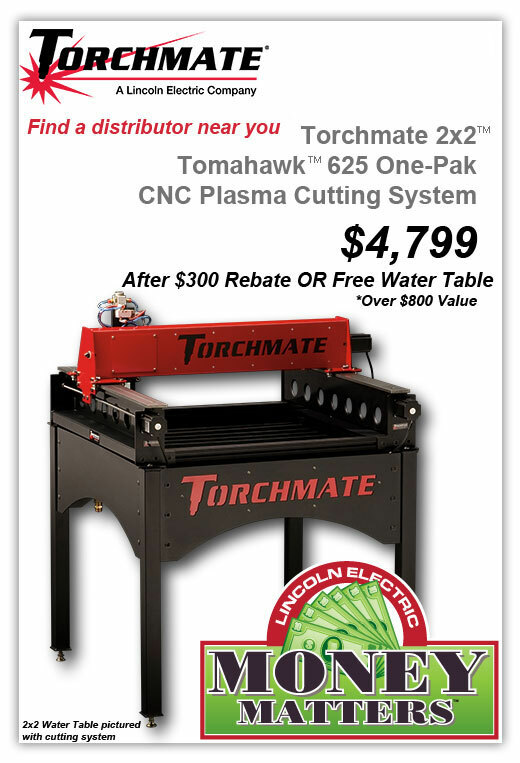 The offer is available October 1, 2011 – February 29, 2012 at participating Lincoln Electric distributor locations across the nation. With this automated cutting system, fabricators can pierce or cut mild steel, aluminum, stainless steel, brass and copper with precision and repeatability. The 2×2™ CNC Prototyping System is a valuable tool for auto repair shops, off-road vehicle owners, home hobbyists, welding and fabrication shops, and HVAC companies.